If your property is in need of mowing, weed-eating, or vegetation clearing, ERS is here for you. Our well trained professionals have everything it takes to restore your property to its former beauty. In addition to our land services, we also are capable of performing civil services for you. From Excavation and Check Dam installing to Dredging and Dewatering, ERS is here to take care of your every need at a reasonable price. 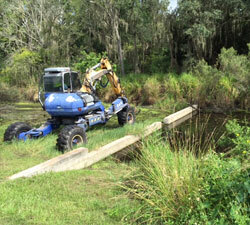 Our services include weed-Eating, land clearing, etc. ERS was the selected contractor to provide ecological services at a railroad facility which involved mowing approximately 30 acres of uneven terrain and weed-eating around numerous monitoring and deep wells. Services also involve clearing vegetation off fence-lines to prevent over-growth from damaging fence. ERS have also been tasked with administering weed control spray to minimize growth on the fence-line. 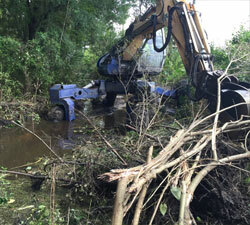 We provided service to remove debris from drainage ditch utilizing heavy equipment with grinder. The purpose of the grinder was to remove blockage without disturbing the stability of the bank. 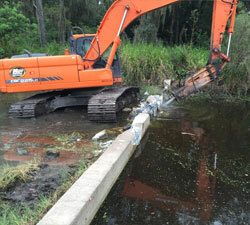 ERS also has experience with removal of trash and debris from ditch-line and property. The debris was loaded out and hauled to an approved landfill for proper disposal.